First of all, I should point out that I got into Lush properly only in 1994. I had heard some of the earlier stuff, I actually liked it but it all amounted to three tracks recorded on three different blank tapes from the radio and that was it. I knew that the Spooky album had come out, I saw the For Love video once on TV, but the record was impossible to find here in Italy (there was no Internet and stuff those days). So I’d say I liked their music, but until 1994 I couldn’t get a whole idea of the variety of their music and song writing. When Split came out, it was a totally different story. That was the greatest record ever made, for me. I was seriously convinced that Lit Up was about me. But that’s another story altogether. Then, after a year and a half, news spread in magazines that they were working on a new album. Fabulous news for me, as I believed that after the flop of Split they would a) split up or b) take a zillion years to make another album. I believe every fan figures this kind of apocalyptic scenario after his favourite band flops. Anyway, Single Girl comes out, lots of press in the UK, the single does well in the charts. I’m happy for the band, I thought they deserved all the success and all the attention they were getting. Their interviews were always great reading. And the promise of the new album coming out on March 18th. Too good to be true! The only frustrating thing in all this was that I had never, NEVER, had one chance to hear the new song. I tried to imagine the words, the music, I invented my own Single Girl in my head. No trace of it here, in the record shops, or radio, or TV. Nothing, nothing, nothing. This gives you an idea of how difficult it was to be a music lover in Italy back then. Unless you were into crap Italian singers repeating the words “love”, “heart” and “forever” at least 300 times in the same song. Hard times, really. Things took a dramatic turn on a Friday afternoon in early February 1996. In those days there was a radio show broadcast on Milan's Radio Popolare called "Pop-Eye" (genius title, I think!). It aired every Friday from 3.00 to 4.00 pm and was basically a DJ playing the latest Britpop or Indie oriented music and reading news from English music magazines (basically, Melody Maker and the NME). About a week before my meeting with Miki and Emma, around the 7th or 8th of February, he premiered "Ladykillers" on the show. I fell in love with that song right after the first 5 seconds. For me it was actually the first Lush release in almost 2 years, because I still hadn't had the chance to hear Single Girl -- no radio or video airlplay here, as I said, and the Import copy arrived much later than the January release. After playing the song, the DJ announced that the girls would come to Italy for a signing session in a then famous (now defunct) record shop in Milan, to meet fans and sign autographs. 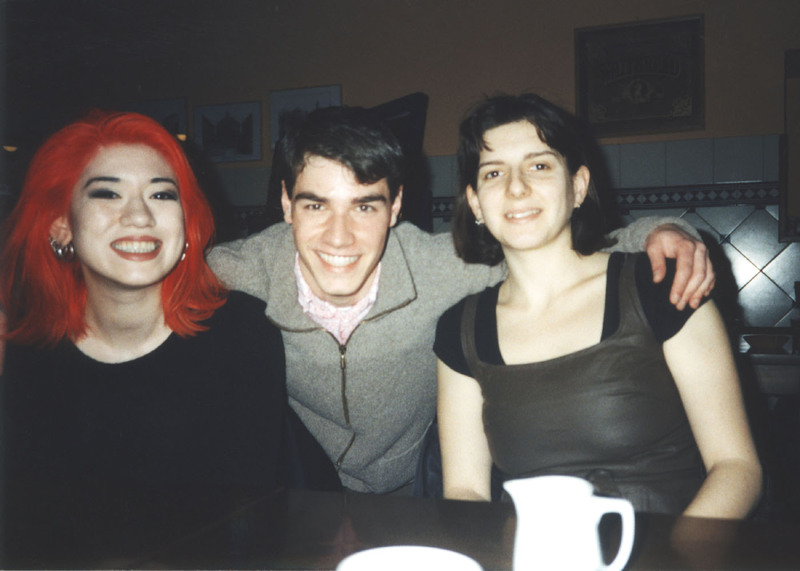 I was totally against that kind of worship in general--I was always the first to deride my friends for queuing up for hours just for an autograph from a member of one band or another--but for Lush I HAD to make an exception. And also, I secretly hoped they would give me a free copy of the new single. So I decided I would go, no matter the consequences. Starting a week before, I skived off school and prepared myself psychologically for my encounter with the Goddesses. Needless to say, my excitement was over the top. Being extremely shy, a conversation or even the smallest compliment was out of question. My English was crap also, so I thought the best I could hope for would be an autograph and then goodbye. I took the train to Milan and headed towards the bloody record store. As usual with me, I got lost and confounded the name of the street the record shop was on with another, similarly named street (Ripa di Porta Ticinese instead of Corso di Porta Ticinese). It took me ages walking to get to the right place, at some point I even considered giving up the whole thing and going to the nearest Virgin Megastore to console myself with the new Pulp record. But perseverance is a virtue, so I decided I HAD to carry on. How would I know if there ever would be another chance? I arrived at the record store at about 4 o’clock -- an hour late, very typical of me. I still remember this detail fondly, because I think it might end up as one of my most ridiculous moments ever. I entered the shop, sticky and sweaty and thirsty and exhausted. No one was there apart from the shop assistant. I got nervous, I mean, all the effort and no one around? I asked the boy, almost raging "WHERE THE F--- ARE LUSH?" He stared at me as if I had just escaped from an asylum. He looked perplexed, but was very kind. “They must have gone to the bar next door for an interview,” he said, more or less. I rushed out of the shop, slamming the door. It would have been too cruel to miss them after all I had done up to that point! After five nanoseconds I was well into the bar. I looked down the long hallway and immediately recognized Miki’s head. God only knows how relieved I felt. I remember thinking to myself "You did it, they’re here, wait a moment and you’ll get what you wanted!" To think I did all this makes me smile now… I was only 18, I was about to meet my fave band of the time, I mean, I would have done anything they had asked me! Emma and Miki were being interviewed by the DJ from the Friday radio show, the three of them sitting around the table. I leaned against the wall behind them, waiting for their heads to turn, to notice me. The interviewer saw me, as I was in his line of sight, but he went on with the questions, completely ignoring me, looking like a tramp and stuck to the wall, totally tired. There was music in the bar so I couldn’t hear anything. After a full five minutes, Miki finally turned and noticed me. I waved hello with my hand and said Ciao. She smiled, I’m sure she understood immediately I was a fan 'cause she made a gesture as if telling me to come closer. I rushed to the table, barely speaking for what seemed like eternal seconds. Emma was beside her, looking really tired and knackered, as if she hadn’t slept for years. Miki was beautiful, very down-to-earth and friendly. I could hardly speak, partly because of my shyness, partly because it was impossible for me to say anything grammatically correct in English, never mind understanding the possible answer. So my “conversation with Lush” amounted to a grand total of three sentences: 1) Where are the guys? (answer - in London); 2) I really loved Split, it’s incredible! (answer - thanks, and some other sentence I didn’t understand) and 3) You’re the best band in the world! (answer - thanks!). Emma was silent but smiled, probably at my naivety and shyness. Then Miki picked out a Lovelife promo card from nowhere, and asked me what my name was. I gave her my blue pen and she wrote “Hey, Daniele!” on the card (they had already signed their names, in black). I couldn’t ask for more really. Well, I could… I took out my camera from my bag and put it in the hands of the DJ, asking him to take a picture of me with the girls, which he did. I prayed in my mind that it wouldn’t turn up too dark, too blurred or whatever (it didn’t, thankfully!). Emma and Miki were happy to do it, and I think it shows from their faces in the picture. After that, I said thanks, hope to see you soon live, and Miki said something like thank you for coming and see you soon. You can understand how I felt afterwards, really really happy and pleased to have discovered that the girls were just as great and friendly as I ever imagined them to be. It was the first and only time in my life I met people I admire (because I always think it all ends up as arse-locking, whatever one says), but it was a great time for me. I started telling friends about the meeting from that very night, the answer was always the same: Lush who? I’ve told this story a million times in the last 12 years, and every time there’s always a small bit, a small detail I thought forgotten that miraculously pops up (the bar’s tiles, the interviewer’s microphone, the mud crusts under my shoes, the cigarettes brand I smoked at the time). I was so pleased to have met them, even though I hated myself for not being shamefaced enough to ask them all I wanted to (Great Lost Question: I’m sure Lit Up is about me, have you been spying on me?). And I was very surprised, a few weeks later, when Lovelife came out, to discover a track--Heavenly Nobodies--where they were against meeting your heroes, because “they don’t stand up to life”… Well, I met mine, and they were really great and friendly people! I was supposed to see them live in November, but the shows were cancelled. So Bill, I have finished! Hope I haven’t bored you too much, it was great for me to get back to my 18th year for a couple of hours!